In “Years to the Day,” two guys in their 40s, very close friends since college, meet for coffee for the first time in four years only to realize how very little they now know each other and how inconsequential this gap of knowledge is. We are either in soggy power-of-friendship territory or David Mamet land. With his world premiere for Skylight Theatre Company, playwright Allen Barton is shooting for somewhere in between. 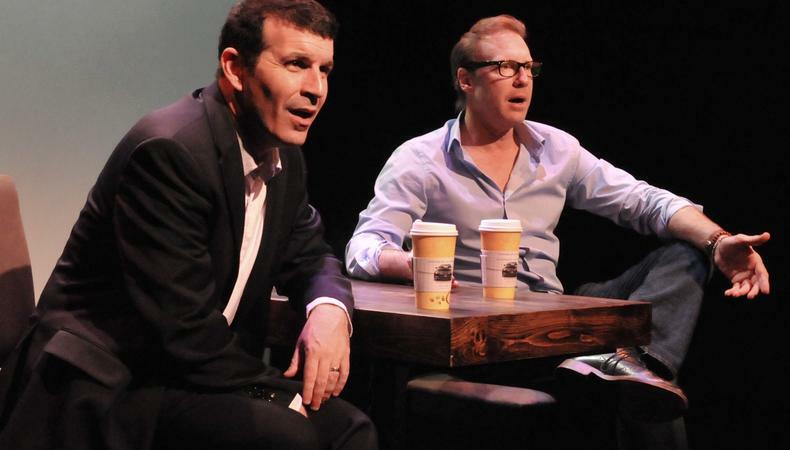 Whatever else you might say about “Years to the Day,” Barton writes entertaining rants, and actors Jeff LeBeau and Michael Yavnieli know how to spew them. Rants and strategically timed revelations are not, however, ideal substitutes for strong writing. Barton’s play is a laborious 80 minutes, 15 minutes into which angry, mortality-obsessed Dan (Yavnieli) and his sensitive, secrets-stuffed buddy Jeff (LeBeau) are inducing audience weariness. This largely obnoxious and maudlin duo may be in an empty café because, after overhearing them for five minutes, any fellow patrons would run screaming for the exits. Allowances must to some degree be made, as the men are damaged, saddled with skeletons, living a lie, desperately lonely, or some combination thereof. Nonetheless, they move through politics, technological gadgets, and the whys and wherefores of a mutual friend’s suicide into heavier, largely predictable disclosures. Dan presses every button, needling and provoking whenever he sees an open wound peeking through. Jeff, who is less of a jerk, gives almost as good as he gets. The unspecified future in which “Years to the Day” is set lets Barton serve up assaults on, among other things, a three-term Latino president. Jeff and Dan have a hip shorthand that allows them to refer to things such as “latest film” or “actress du jour” without ever having to deal with names. We have no sense of what either of these men does professionally. Yavnieli, suited and coiled into tight little bundle of righteous anger, would actually find himself quite at home going mano a mano with Teach in “American Buffalo” or the sharks of “Glengarry Glen Ross.” Credit the actor for taking Dan from well-spoken, scabrous blowhard to a man who can wring some charisma—or at least audience understanding—out of his not-so-P.C. convictions. LeBeau has the easier task, as we’re usually on Jeff’s side, wishing Dan would lay off. In LeBeau’s performance we see Jeff’s intelligence and buy his pain, which counts for plenty. As an indictment of a digital age that permits four years to elapse without these two friends needing a face-to-face, “Years to the Day” feels false. Forget preoccupations; if these guys were ever this close, one of them would reach out or at the very least pick up the phone. In short, these two probably will always find a way to connect, which is by no means a good thing. Presented by Skylight Theatre Company at the Beverly Hills Playhouse, 254 S. Robertson Blvd., Beverly Hills. April 6–May 12. (702) 582-8587 or www.ktctickets.com.